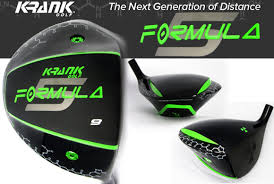 Krank Golf® Formula 5 Driver – Taking it to the next level. Krank Golf® is proud to announce the launch of the highest performing golf driver in the world. The New Formula 5 Driver is the latest creation by Krank Golf®, the world’s leader in high performing USGA legal golf drivers. This new driver encompasses everything Krank Golf® has learned over the past 10 years in golf driver design. Maximum Energy Transfer Technology : This Exclusive Krank Golf® technology stores the energy created at impact more forward in the driver head and release the energy back to the ball more efficiently than any driver made today. Maximum Rigidity : Krank Golf® has designed this driver to resist bowing and deforming at impact. Thus, diminishing the loss of energy created at impact through the deformation of the driver head itself. Maximum Metal Hardness : Krank Golf® is at the forefront of metal technology. Maximizing metal hardness is key to performance. Krank Golf® Drivers exceed all other manufactures in metal hardness technology. Toe and Heel Adjustable Weighting : This New Driver can be played from 194 Grams to 208 Grams. This weighting system allows every golfer to dial in the best possible head weight needed for their swing. 5, 6, and 7.5 degree lofts have no weights in them. So can we put on the site when ordered, stating these lofts do not require the Weight Kits. 100% Forged Driver : Krank Golf® only builds 100% Forged Drivers. This is one of the most important aspects of all Krank Golf® Drivers and one of the reasons Krank Golf® completely dominates the world of distance hitting with 13 RE/MAX World Long Drive Championships. There is no comparison to hitting 100% Forged driver heads over a cast driver heads, even with insert faces. The forging process creates more ball speed, less spin and far better durability. Handmade : All Krank Golf® Drivers are handmade. This insures constancy and performance with every driver sold. We are not part of some large assembly line manufacturing process. Krank Golf® is committed to finding the furthest possible edge of Driver performance. The New Krank Golf® Formula 5 Driver is the best of the best and will continue to completely dominate the world of distance hitting. Maximize your game, your distance and your score. Welcome to the world of Krank Golf®!